Save $125 when you purchase these items as a kit! Whether you are fresh out of dental school or transitioning into a new practice, the Practice Starter Kit has essential tools for your success. Dental Letters provides instant, professional correspondence for patients, insurance companies and vendors, while the Employee Policy Manual uses chapter-by-chapter instructions to help you develop a customized employee handbook for your office. 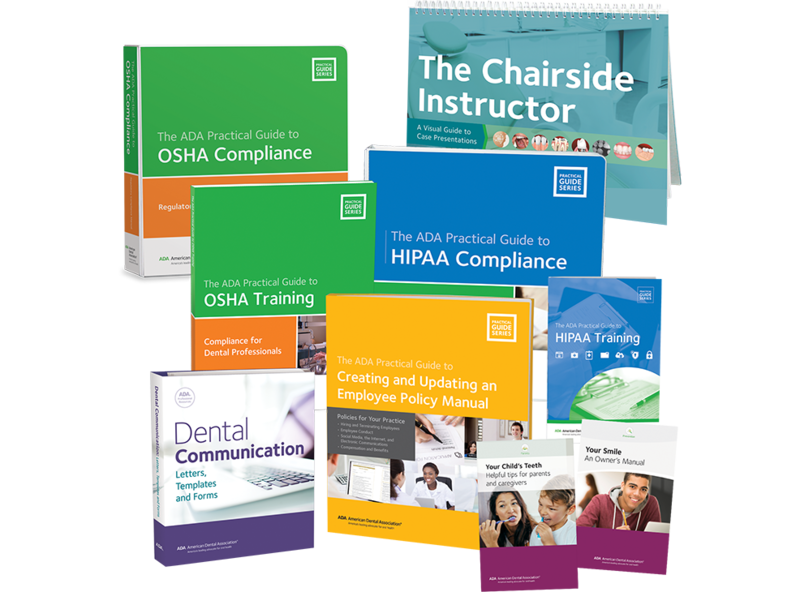 HIPAA and OSHA resources guide you through federal regulations and compliance requirements, as well as staff training. Patient education offerings include The Chairside Instructor and two of the ADA’s most comprehensive patient education booklets, Your Smile: An Owner’s Manual and Your Child’s Teeth.